In just two semesters, you can earn a certificate as a Dental Assistant and become an important part of the team in a dentist’s office, public health agency or other dental industry setting. You will assist the dentist chair-side, expose and develop X-rays, maintain infection control, carry out lab procedures and assume some administrative duties. At MCC you have the option of attending full- or part-time as you pursue your certificate – depending on your work and family obligations. The program is offered at the Legacy Foundation Allied Health Sciences Building, a state-of-the-art clinical lab and classroom facility on MCC’s Bullhead City campus. Dental assistant may be your lifetime career, or this introduction to the field of dental health services may entice you to go on to become a dental hygienist or a dentist. Regardless of your path, you will be helping people of all ages maintain their overall health through good dental care. Can I take only one course at a time? Yes, this program may be taken on a part-time basis. It will simply take longer to complete. Part-time students must meet with a program advisor. If you choose to take all the courses as they are offered, you can complete your certificate in as little as one academic year. How can I prepare for enrollment in the Dental Assisting program? Students interested in pursuing a career as a dental assistant must first register to become a student at MCC. The academic advisor will arrange assessment testing to determine a student’s readiness for college coursework. Dental assisting students must show college-level abilities on the assessment test in the areas of math, reading and writing. Will my MCC Certificate in Dental Assisting help me be accepted into the MCC Dental Hygiene program? Yes, the application criteria for dental hygiene awards additional points for graduates of the MCC dental assisting program. However, dental hygiene applicants must complete 31 credit hours of prerequisite coursework before they are eligible to apply. All prerequisite courses are available at MCC. With the exception of two courses, the dental assisting program coursework will not transfer to the dental hygiene program. Successful completion of DAE 106 Dental Radiography and DAE 118 Dental Materials meets the dental hygiene program requirements for radiology and dental materials. Can I work while I’m a student in the Dental Assisting program? The status of a dental assisting student is considered full-time. It is strongly recommended that a student not work more than 10-15 hours per week while school is in session. Academic demands such as class and lab time, commuting, homework, study time and clinical assignments require about 40-50 hours per week. Do I need a Hepatitis B vaccine to be a dental assistant? Yes, all healthcare providers with patient contact are required to be vaccinated against Hepatitis B. Other vaccinations may be necessary depending on the area of employment. How can I find out more about the Dental Assisting program? Contact MCC Dental Programs Office at 928.704.7797. How long is the Dental Assisting program? The Dental Assisting Program is two semesters long – beginning in the Fall and graduating at the end of Spring semester each academic year. Yes, it is very important that all dental assisting students attend all classes, labs and clinical sessions. The fast pace of this program does not allow for missed classes to be made up without disrupting the schedule of the entire program. Is the Dental Assisting program accredited? The MCC Dental Assisting program is not currently seeking accreditation from the Commission on Dental Accreditation of the American Dental Association. What are the potential earnings for a Dental Assistant? In Mohave County, trained dental assistants can expect to enjoy an average hourly pay of $11-14. 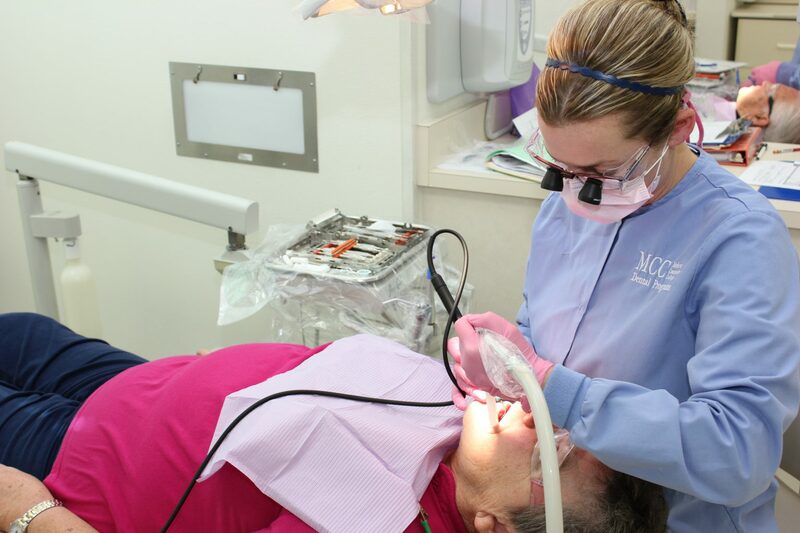 Demand for trained dental assistants is very high in Mohave County. The Arizona average pay is about $15 per hour for a trained dental assistant. What financial aid options do I have for the Dental Assisting program? Financial aid in the form of grants and loans may be available to assist students with the costs of this program. Students who are interested should apply for aid using the Free Application for Federal Student Aid (FAFSA) to see if they qualify. This form is available online at www.fafsa.ed.gov or at your local MCC campuses. Financial Aid advisors are available on each campus to work with students individually to assist students through the application process. A Dental Assistant has many duties in a dental office: assisting the dentist chairside in the performance of dental treatment procedures, exposing and developing x-rays, maintaining infection control, engaging in administrative duties and performing laboratory procedures. Employment opportunities exist in the private dental office, hospitals, government agencies, industry sales and public health programs. Where is the Dental Assisting program offered? All of the Dental Assisting Program face-to-face courses and labs will be offered at the Legacy Foundation Allied Health Sciences Building in Bullhead City. Some courses will contain online components. All clinical instruction will be in the MCC Dental Clinic and in local dental offices.